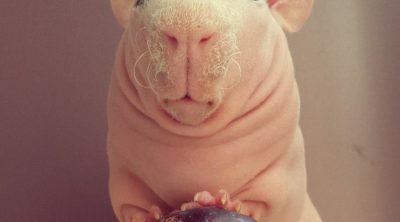 Can Guinea Pigs Eat Apples? How about Skin an Seeds? 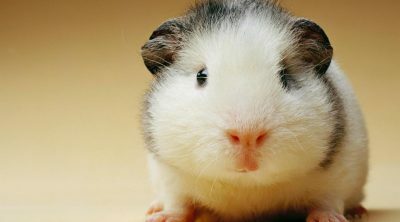 Guinea pigs are so small and fluffy and cute and lovable! If you are the proud owner of a guinea pig, you surely know how great companions they can be. A great amount of attention has to be paid to their care to prevent any health concerns. Apples, for instance, are known to be the world’s healthiest foods, but here comes the great question: can guinea pigs eat apples? We all know the saying that “An apple a day keeps the doctor away.” We all know how delicious and healthy apples are but can they be eaten by these small fur balls? Here are all your answers. What Type of Apples Can Guinea Pigs Eat? Guinea pigs digestive system is different than a human digestive system. 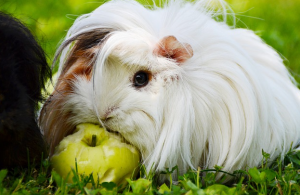 Their digestive systems require a diet that is low in fats and sugars but is high in fiber, and preferably contain vitamin C.
Can guinea pigs eat apples? Of course, they can. 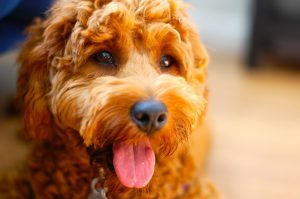 However, before chopping this fruit into small pieces and giving it to your furry friend, there are some things you should know first. Apples should be fed as a treat only and not as a major source of nutrition. The main diet of a guinea pig should be fresh hay, vitamin C pellets (they are unable to supply vitamin C on their own), and fresh, clean water. 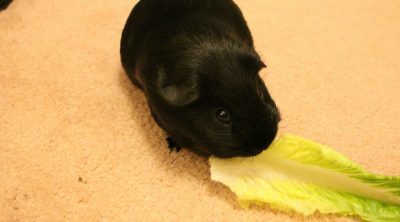 Guinea pig’s also love large amounts of dark leafy greens. All fruits and vegetables should be given in moderation. These snacks are designed to be special treats only. Yes, they can eat apples, but that’s not what they need. A healthy guinea pig’s diet needs to contain lots of fiber rather than sugar. Sugary treats should be given only sparingly. Like stated before, guinea pig’s can’t make their own vitamin C and need to get this as a supplement. Most fruits contain vitamin C, which can be beneficial, however apples and other fruits are also high in sugar. Although, these sugars are natural, guinea pig’s have hard time digesting too much sugar. This can lead to pain and digestive system problems. Eating excess sugar is the worst thing for your furry pal’s tummy. In a guinea pigs tummy, apples may be the equivalent of the sugary candy, desserts, and drinks for humans. 1 medium apple contains approximately 18 grams of sugar. Apples represent, indeed, a very nutritious treat, but this doesn’t mean that you have to shove them down your guinea pig’s throat. Just because they might be your favorite fruit, does not necessarily mean that it’s also their favorite treat. 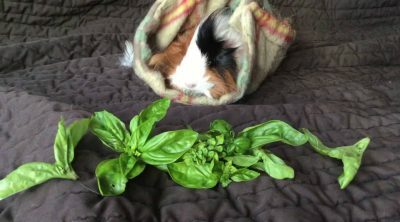 Just like all the veggies and fruits you plan on giving your cavy, you need to run a test first. Guinea pigs are quite picky animals and you may find it surprising that they won’t just eat anything you offer them. Cut a small piece of apple and leave it in the cage. 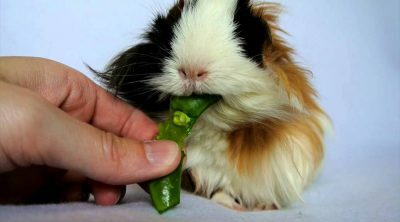 You can also hand feed it, but this depends on how comfortable your guinea pig is feeling with you at this particular point. This is the part where you have to observe closely how much he likes it or how much he rejects this piece of fruit. Moreover, there is the possibility of your guinea pig being new and feeling shy around people. If this is the case, he will surely not eat your treat. It doesn’t mean that he does not like it. It just means that your furry pet is not comfortable enough with you and that is why he acts cautious. Don’t worry if he ends up doing this. You can try again later when you gain his trust. The first thing you should always keep in your mind is that apples are just treats. No matter how much they end up loving them, apples should not be a permanent part of your pet’s diet. Guinea pig’s diet should consist mainly of hay, pellets and, occasionally, fruits and vegetables. 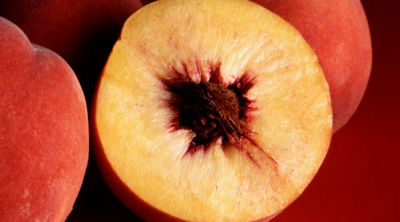 If you are giving him apples, make sure you cut the fruit into tiny pieces. It will be easier for them to chew the fruit and will also help with their digestion. Don’t make the mistake of giving him a whole apple. Many owners do this, but they risk of choking the poor animal, without even knowing it. Another thing you should consider is that even though apples bring a great amount of health benefits, they are acidic. This means that excessive consumption can have serious consequences on your guinea pig. Mouth sores are just one of these consequences. If you discover that your pet loves these fruits, you should consider introducing them into his diet slowly and feed it once a week. Closely observe your pet’s behavior. Also, make sure to check his mouth to see if they have developed any sores. Additionally, make sure to check your guinea pig’s digestive system. In other words, see if he is having a diarrhea. If you notice loose stools, start out by cutting back on the amount of apple you are giving him. Even more, you can also put a stop to the whole apple feeding process. Guinea pigs can eat all varieties of fresh apples. You just need to make sure the apples are fully ripe without a sour taste. They simply might not like to eat sour tasting apples. Additionally, don’t feed apple seeds to your guinea pigs. Apple seeds contain cyanide which are toxic substances and your pets may also choke on the seeds. Apple skin contains fiber and is okay to feed to your guinea pigs in moderation. You may even give them occasional apple leaves to eat since they contain a little calcium. 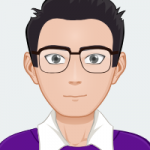 Your beloved guinea pig will be much healthier and happier in the long run with a stable and nutritious diet designed especially for guinea pigs digestive system. Always make sure that your pet has plenty of fresh hay, supplemental vitamin C, dark greens, and clean water for every day. Guinea pigs can certainly eat apples occasionally. Just keep in mind that they should be given in moderation, this way there shouldn’t be any problems regards to your pet’s health.